While some people's crazy colors are green, blue or purple, those are more my normal speed. 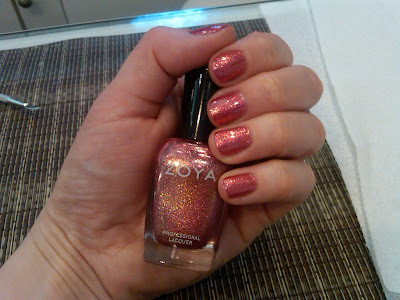 So this week, I decided to go a little crazy (by my standards) with Zoya Gloria -- a metallic rosy red liberally packed with gold glitter. Seen here with three thin coats -- two weren't quite dark enough for my taste! love tht color on u!